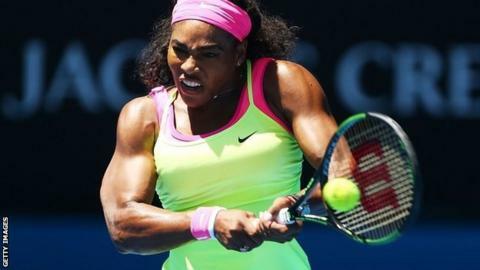 Serena Williams reached the third round of the Australian Open with a straight-sets win over Russia's Vera Zvonareva. The American top seed, 33, came through a tight first set to win 7-5 6-0 as the temperature reached 33C in Melbourne. Two-time champion Victoria Azarenka defeated eighth seed Caroline Wozniacki 6-4 6-2. Men's top seed Novak Djokovic thrashed Andrey Kuznetsov 6-0 6-1 6-4 and defending champion Stan Wawrinka beat Marius Copil 7-6 (7-4) 7-6 (7-4) 6-3. Victoria Azarenka was back to form after an injury-blighted season as she beat eighth seed Caroline Wozniacki. After overcoming her fellow former world number one, the Belarusian will play Czech 26th seed Barbora Zahlavova in the third round. There was no missing Azarenka, in bright yellow, as she dictated play from the baseline and wrapped up victory in 98 minutes. The 2012 and 2013 champion broke the Dane twice in the second set and clobbered 31 winners in the match. Serena and Venus Williams are back in round three of the Australian Open, 17 years after their first visit to Melbourne. Venus, 34, beat Lauren Davis 6-2 6-3 to ensure both sisters will be involved in the last 32 on Saturday. The pair first played at Melbourne Park in 1998, with Venus beating Serena in the second round. "I just remember what a tough match [it was]," Venus said. "It was just relentless. I think it finally ended with a break in the third. That's all I can remember. "It was very tough I think for both of us. Neither one of us could get the upper edge. It was just a marathon." It was 1990s revival time on Rod Laver Arena as Jim Courier resumed battle with Boris Becker. On-court interviewer Courier enjoyed his usual post-match joust with Becker's charge, Djokovic, as they discussed social media. "Could you maybe tell him to lay off the hashtags? I think Boris is a little hashtag heavy," Courier said. "Maybe you can coach him a little bit, I like your feed more than his." Minutes later, Becker took to Twitter to respond: "Don't understand why #Courier would ask @DjokerNole after a good win @AustralianOpen about my #...wrong place or timing mate." Becker enjoyed a thumping 6-1 record against Courier in their playing days. Benjamin Becker said he hoped home favourite Lleyton Hewitt carried on playing after defeating his fellow 33-year-old in five sets. The German was winning in five sets for the first time in his career - securing a 2-6 1-6 6-3 6-4 6-2 victory. Becker, whose win over Andre Agassi in the third round of the US Open in 2006 prompted the American to retire, said: "I hope it's not Lleyton's last match because then I get asked about it all the time. "He is a great warrior, an unbelievable player, so I hope he continues." It might have been an off-day for Andy Murray but his mind had not wandered far from tennis, with the previous night's Rafael Nadal epic on his mind. The Spaniard overcame stomach cramps to beat Tim Smyczek in four hours and 12 minutes, with the match roundly hailed as a classic. It clearly prompted memories for the British number one of his four-set win over Robin Haase at the US Open last September. He tweeted: "When I cramped and won in the US Open last year I was a 'drama Queen, unfit, needs to see a shrink, faker' weird…"
Heather Watson was back on court - the same court - 48 hours after losing in the singles, and requiring treatment from the doctor. The British number one said on Tuesday she had struggled for energy but that she expected the issue to pass quickly, and so it appeared on Thursday. Watson and her Russian partner Alexandra Panova, who held two match points against Maria Sharapova on Wednesday, fought through to round two of the doubles. With the temperature nudging 34C, the pair led Shahar Peer and Annika Beck 2-6 7-5 3-1 on court 10 when the Israeli-German team retired. "No further questions on that. I object. Sustained. Thank you." Venus Williams finds a novel way of refusing to discuss why she and Serena have pulled out of the doubles. "I twirl all the time in dance class. It's called a Chaines Spin. I've been working on it. I have to really work on my spotting. My coach tells me to whip my head around. As a dancer, we do lots of turns and have soft hands." Serena Williams reveals a love of…. twirls. "I didn't name my son by Stefan Edberg, if you refer to that." Novak Djokovic is asked whether he named his son Stefan after coach Boris Becker's great rival. "Thanks for your messages of support. Yesterday was tough. Today I had a light training session & everything went fine," tweeted Rafael Nadal. The Spaniard, seeded third, overcame stomach cramps to beat qualifier Tim Smyczek in five sets to reach the third round. Curse or myth - do periods affect performance? Read more on Curse or myth - do periods affect performance?